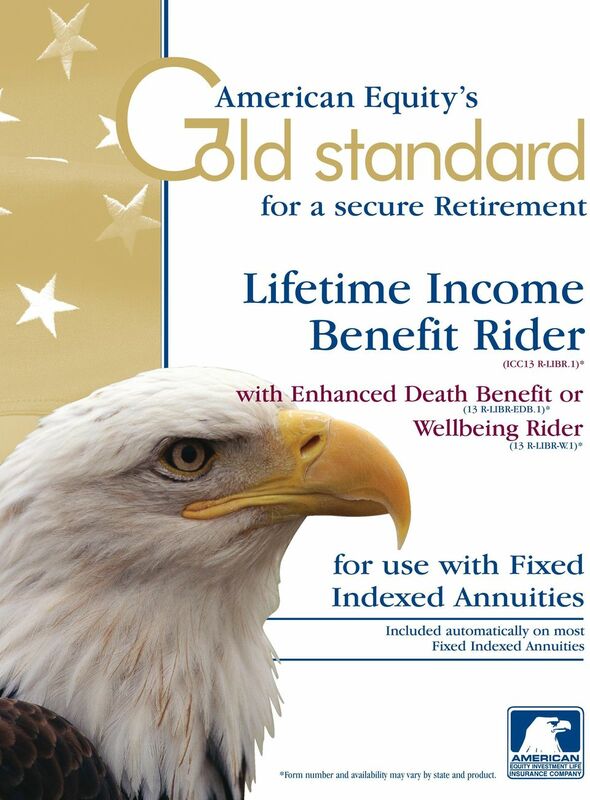 1 for a secure Retirement Lifetime Income Benefit Rider (ICC13 R-LIBR.1)* with Enhanced Death(13Benefit or R-LIBR-EDB.1)* Wellbeing Rider (13 R-LIBR-W.1)* for use with Fixed Indexed Annuities Included automatically on most Fixed Indexed Annuities *Form number and availability may vary by state and product. 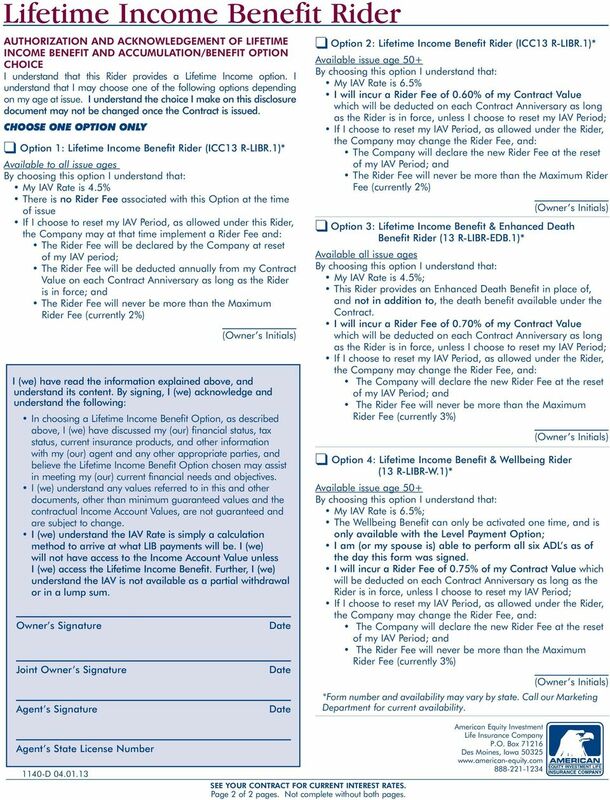 11 Lifetime Income Benefit Rider FIXED INDEXED ANNUITY VERSION DISCLOSURE STATEMENT The Lifetime Income Benefit (LIB) is available with your Contract if owner and annuitant are the same person. 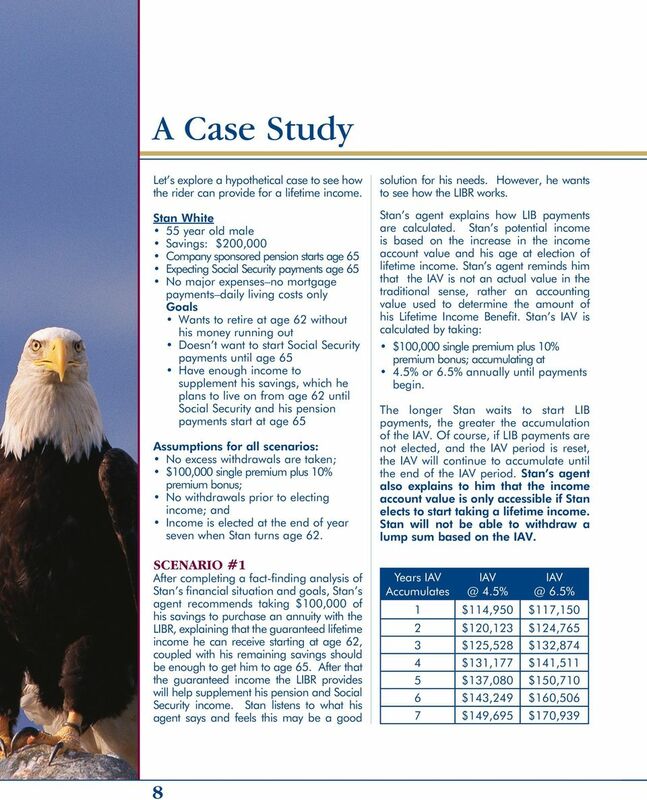 Based on the Income Account Value (IAV) Rate you choose, your IAV will grow at a predetermined rate to provide you with a lifetime of income in the future. 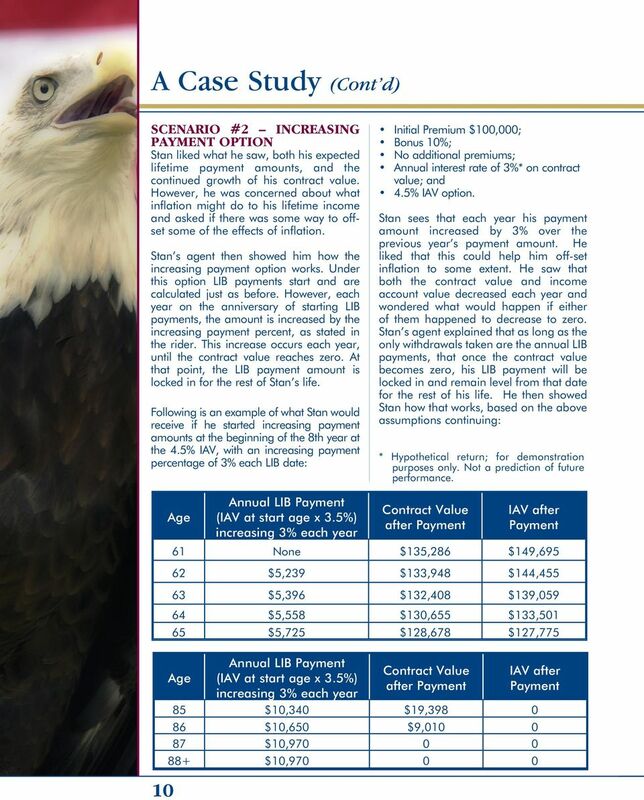 The IAV is an accounting value used only to calculate your Lifetime Income Benefit. It is not part of your Contract Value and is not available for partial withdrawal or in a lump sum. You will not have access to the IAV unless you elect the Lifetime Income Benefit. The Lifetime Income Benefit is available to you without a surrender charge and without having to annuitize your Contract. This means that you maintain control of all money accumulated in your Contract and can access that money at any time, with certain restrictions. This Disclosure is a summary of the key benefits and limitations; for more information please see the brochure and your Contract. The choice you make on this disclosure document may not be changed once the Contract is issued. Keep in mind your contract contains a free look period. HOW MUCH INCOME CAN I GET? That depends on several factors, including the premium paid and any applicable premium bonuses credited, the IAV Rate you choose, the amount of time the IAV grows, your age at the time payments begin, and the Income Option you choose. Please review your contract carefully and when the time comes, feel free to contact us to discuss potential payment options and amounts. HOW IS THE INCOME ACCOUNT VALUE CALCULATED? 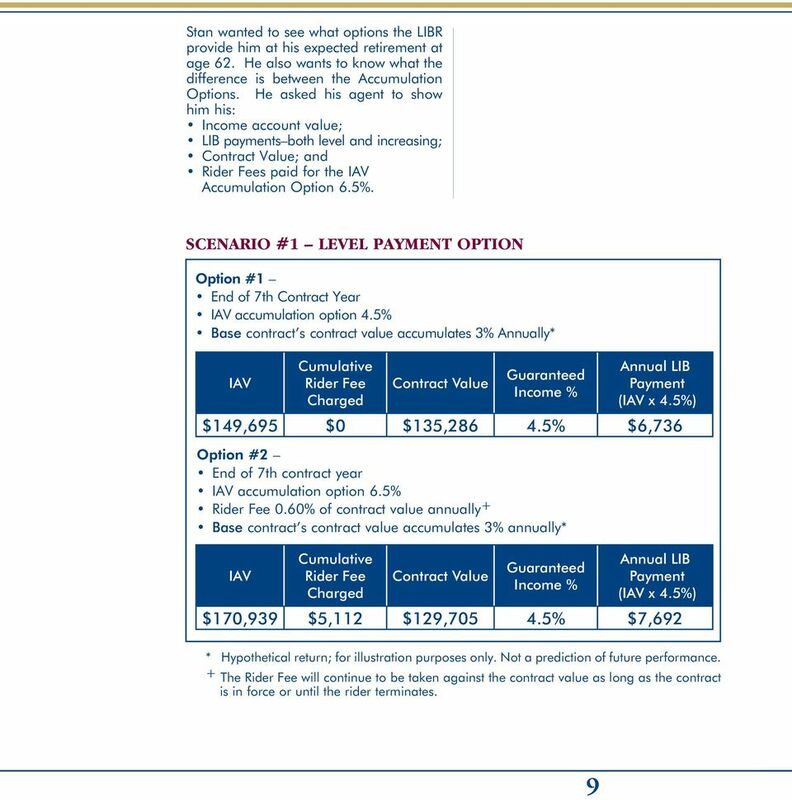 Your initial IAV is your total premium plus any applicable bonus. The IAV accumulates at the IAV Rate, which is set at issue, and continues to grow until payments begin or the end of the IAV Period, unless you submit a written request to reset. 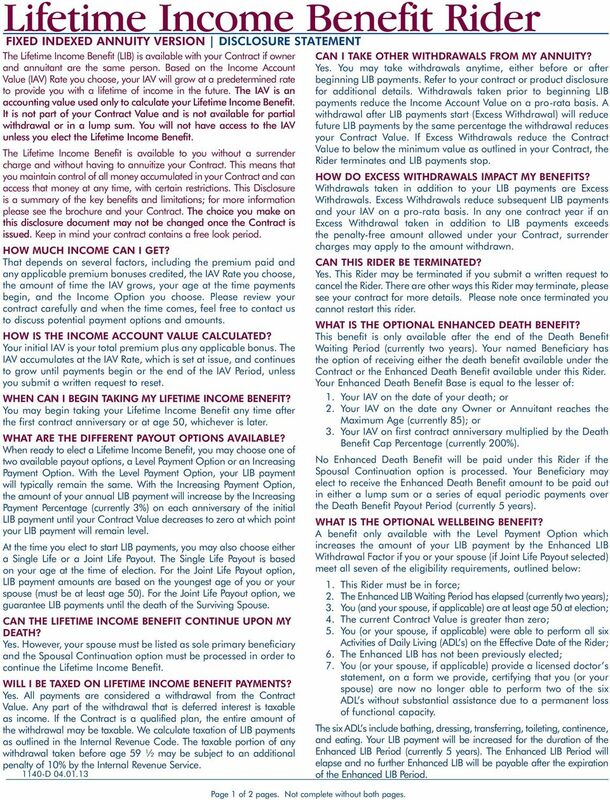 WHEN CAN I BEGIN TAKING MY LIFETIME INCOME BENEFIT? You may begin taking your Lifetime Income Benefit any time after the first contract anniversary or at age 50, whichever is later. WHAT ARE THE DIFFERENT PAYOUT OPTIONS AVAILABLE? 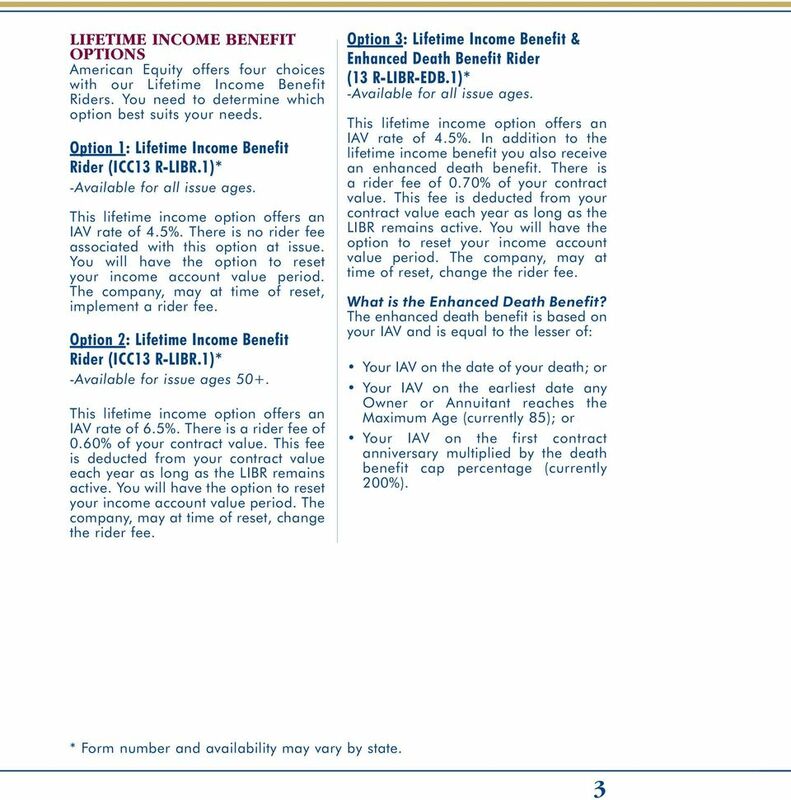 When ready to elect a Lifetime Income Benefit, you may choose one of two available payout options, a Level Payment Option or an Increasing Payment Option. With the Level Payment Option, your LIB payment will typically remain the same. With the Increasing Payment Option, the amount of your annual LIB payment will increase by the Increasing Payment Percentage (currently 3%) on each anniversary of the initial LIB payment until your Contract Value decreases to zero at which point your LIB payment will remain level. At the time you elect to start LIB payments, you may also choose either a Single Life or a Joint Life Payout. The Single Life Payout is based on your age at the time of election. 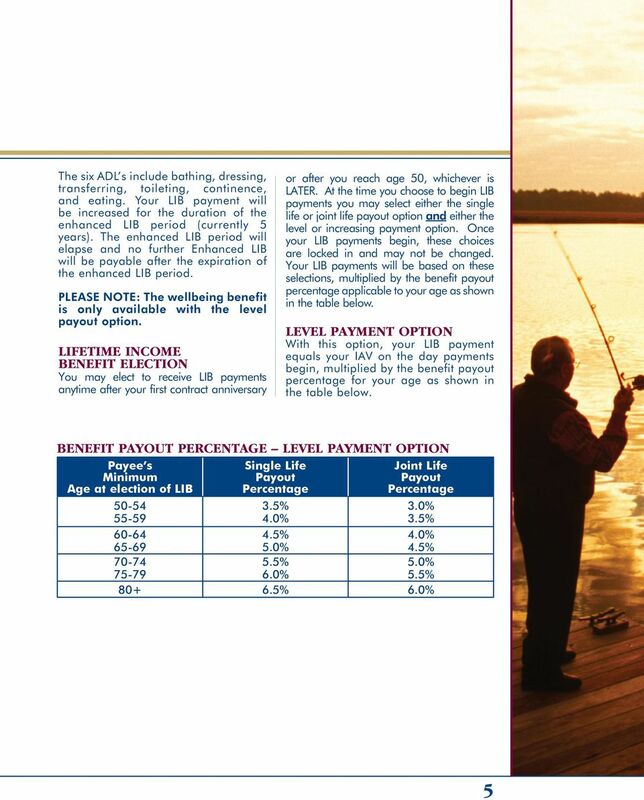 For the Joint Life Payout option, LIB payment amounts are based on the youngest age of you or your spouse (must be at least age 50). 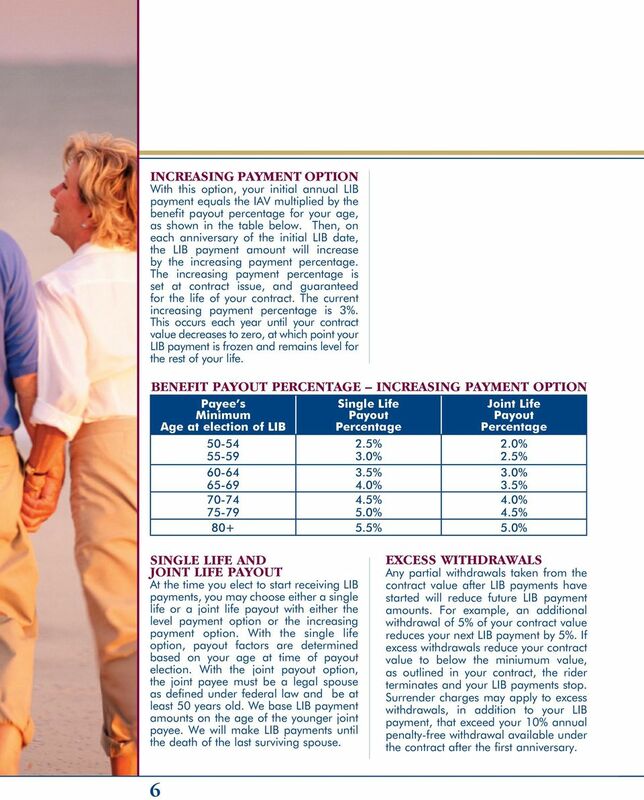 For the Joint Life Payout option, we guarantee LIB payments until the death of the Surviving Spouse. CAN THE LIFETIME INCOME BENEFIT CONTINUE UPON MY DEATH? Yes. However, your spouse must be listed as sole primary beneficiary and the Spousal Continuation option must be processed in order to continue the Lifetime Income Benefit. WILL I BE TAXED ON LIFETIME INCOME BENEFIT PAYMENTS? Yes. All payments are considered a withdrawal from the Contract Value. Any part of the withdrawal that is deferred interest is taxable as income. If the Contract is a qualified plan, the entire amount of the withdrawal may be taxable. We calculate taxation of LIB payments as outlined in the Internal Revenue Code. 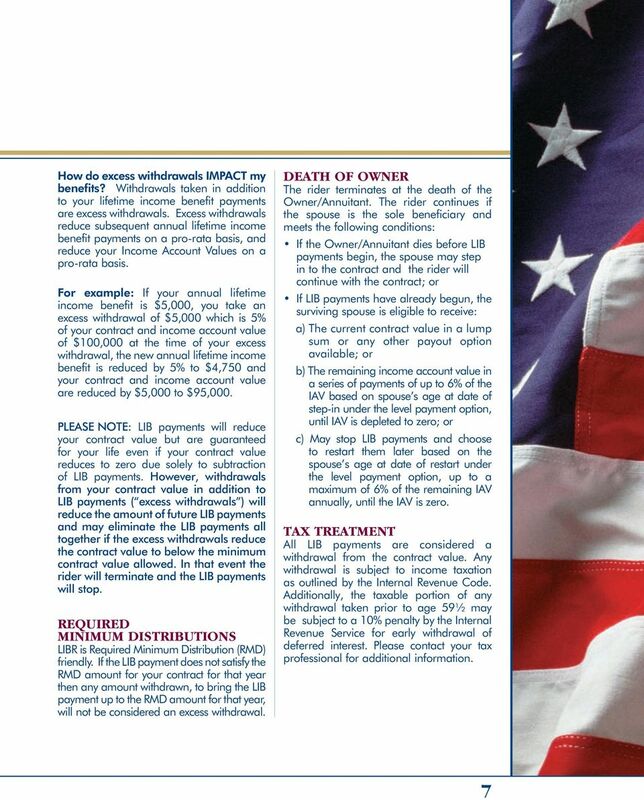 The taxable portion of any withdrawal taken before age 59 ½ may be subject to an additional penalty of 10% by the Internal Revenue Service D Page 1 of 2 pages. Not complete without both pages. CAN I TAKE OTHER WITHDRAWALS FROM MY ANNUITY? Yes. You may take withdrawals anytime, either before or after beginning LIB payments. Refer to your contract or product disclosure for additional details. Withdrawals taken prior to beginning LIB payments reduce the Income Account Value on a pro-rata basis. A withdrawal after LIB payments start (Excess Withdrawal) will reduce future LIB payments by the same percentage the withdrawal reduces your Contract Value. If Excess Withdrawals reduce the Contract Value to below the minimum value as outlined in your Contract, the Rider terminates and LIB payments stop. HOW DO EXCESS WITHDRAWALS IMPACT MY BENEFITS? Withdrawals taken in addition to your LIB payments are Excess Withdrawals. Excess Withdrawals reduce subsequent LIB payments and your IAV on a pro-rata basis. In any one contract year if an Excess Withdrawal taken in addition to LIB payments exceeds the penalty-free amount allowed under your Contract, surrender charges may apply to the amount withdrawn. CAN THIS RIDER BE TERMINATED? Yes. This Rider may be terminated if you submit a written request to cancel the Rider. There are other ways this Rider may terminate, please see your contract for more details. Please note once terminated you cannot restart this rider. 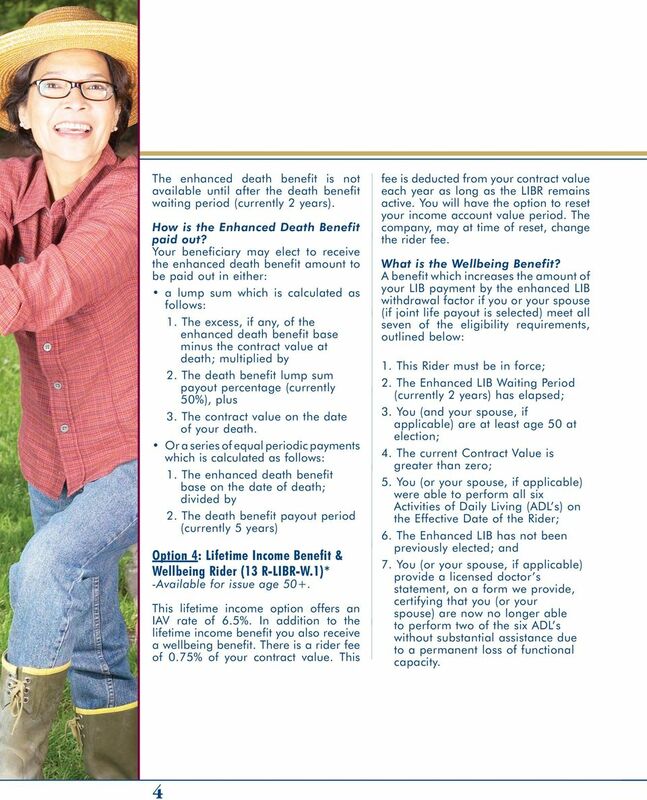 WHAT IS THE OPTIONAL ENHANCED DEATH BENEFIT? This benefit is only available after the end of the Death Benefit Waiting Period (currently two years). 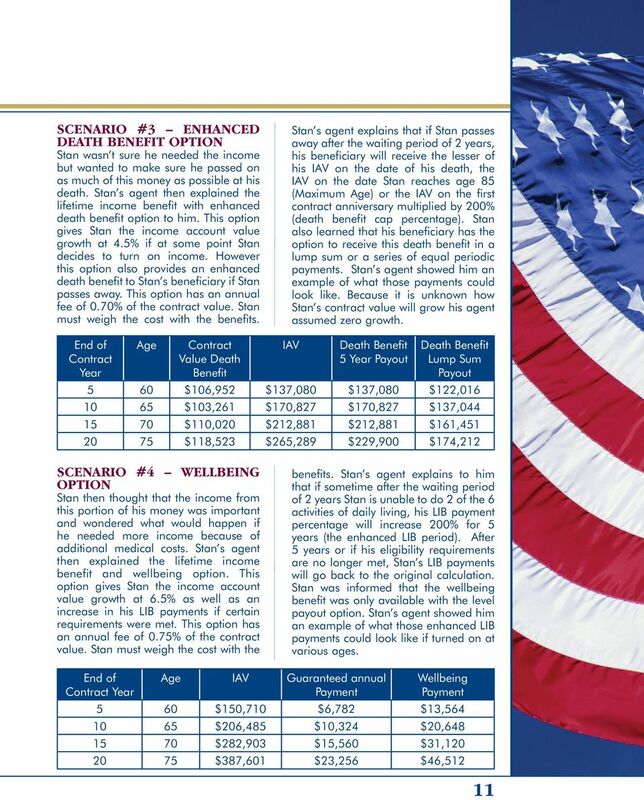 Your named Beneficiary has the option of receiving either the death benefit available under the Contract or the Enhanced Death Benefit available under this Rider. Your Enhanced Death Benefit Base is equal to the lesser of: 1. Your IAV on the date of your death; or 2. 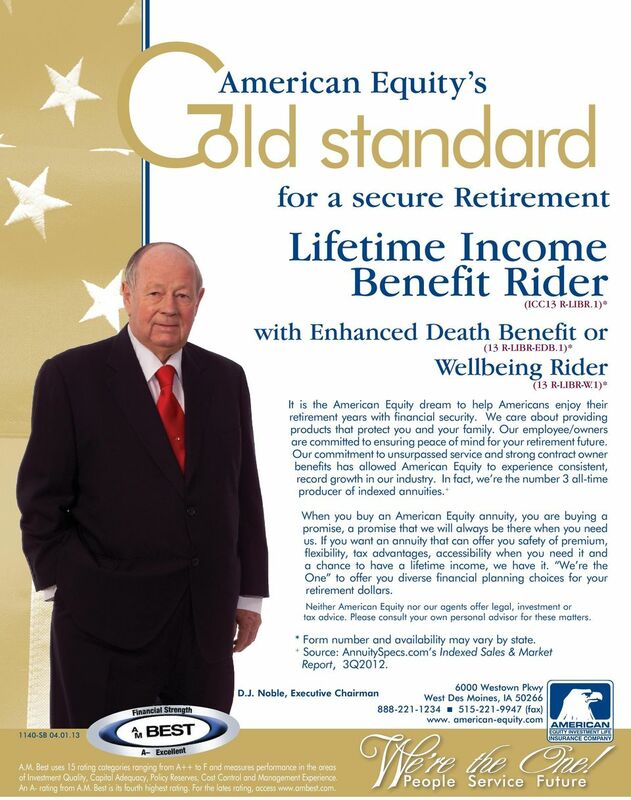 Your IAV on the date any Owner or Annuitant reaches the Maximum Age (currently 85); or 3. Your IAV on first contract anniversary multiplied by the Death Benefit Cap Percentage (currently 200%). No Enhanced Death Benefit will be paid under this Rider if the Spousal Continuation option is processed. Your Beneficiary may elect to receive the Enhanced Death Benefit amount to be paid out in either a lump sum or a series of equal periodic payments over the Death Benefit Payout Period (currently 5 years). WHAT IS THE OPTIONAL WELLBEING BENEFIT? 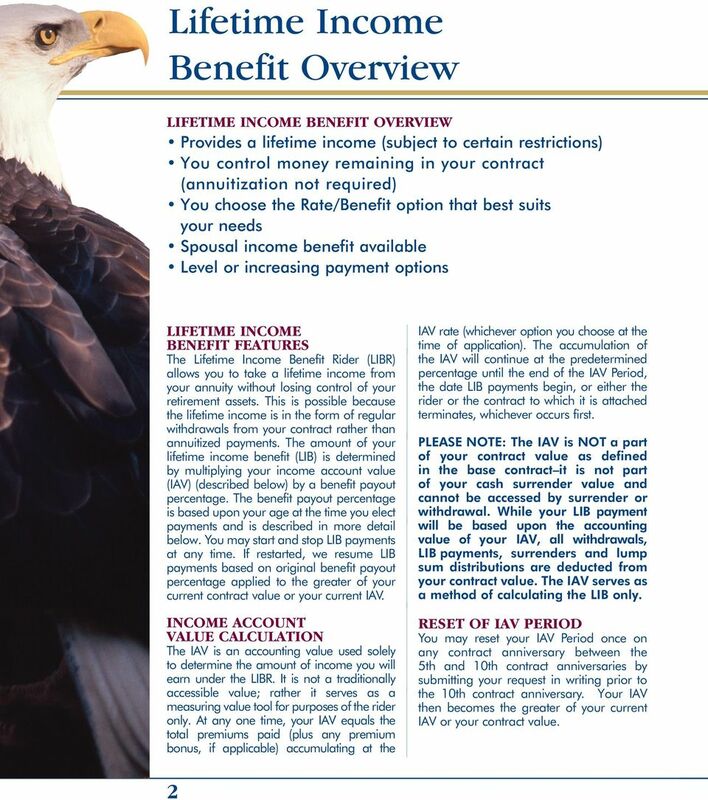 A benefit only available with the Level Payment Option which increases the amount of your LIB payment by the Enhanced LIB Withdrawal Factor if you or your spouse (if Joint Life Payout selected) meet all seven of the eligibility requirements, outlined below: 1. This Rider must be in force; 2. The Enhanced LIB Waiting Period has elapsed (currently two years); 3. You (and your spouse, if applicable) are at least age 50 at election; 4. The current Contract Value is greater than zero; 5. You (or your spouse, if applicable) were able to perform all six Activities of Daily Living (ADL s) on the Effective Date of the Rider; 6. The Enhanced LIB has not been previously elected; 7. You (or your spouse, if applicable) provide a licensed doctor s statement, on a form we provide, certifying that you (or your spouse) are now no longer able to perform two of the six ADL s without substantial assistance due to a permanent loss of functional capacity. The six ADL s include bathing, dressing, transferring, toileting, continence, and eating. Your LIB payment will be increased for the duration of the Enhanced LIB Period (currently 5 years). The Enhanced LIB Period will elapse and no further Enhanced LIB will be payable after the expiration of the Enhanced LIB Period.